I tried these clothes on from ASOS in November and luckily, they are still available on the website. ASOS fuller bust goes up to size 14 which just fits me. This was my first order ever from ASOS and I am definitely interested in trying more of their fuller bust clothing. A huge amount of their fuller bust clothing is strappy cami tops which isn’t something I generally wear since I prefer not to wear styles requiring a strapless bra but hopefully they release some new dresses for Spring/Summer. 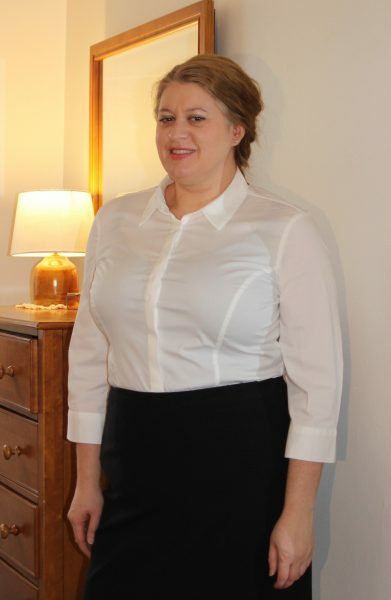 First, from ASOS is a white blouse with princess seams. 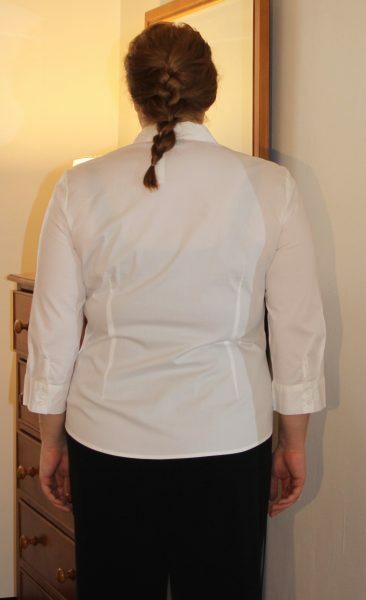 The blouse has extra buttons in the bust area to help with gaping. The material was stiff but might soften with washing. I was pleased with the quality of this shirt. I expected it to be much thinner and poorly fitted for the $29 price. The not so great about this shirt – it was hard to get the wrinkles out. I tried steaming it first (which doesn’t work so great on shirting fabric) and then dragged out my iron. This shirt is difficult to iron. In full disclosure I worked in a costume shop for three years as a college student so my ironing skills are above average. The only way to iron the princess seams precisely would be with a ham and sleeve board. If I had a job that required button down shirts then I would probably purchase this one in bulk. 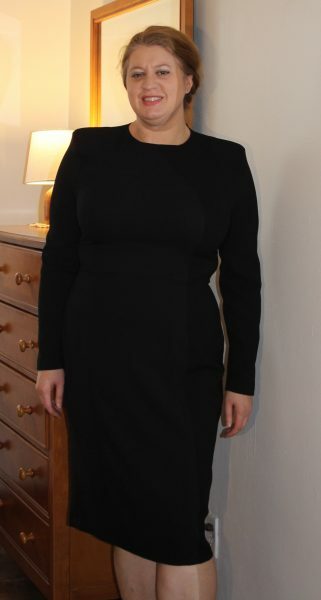 Also, in my order was a black sheath dress. This fit well although the fabric felt a bit cheap. I didn’t like the width of the shoulders or the massive shoulder pads either. If you need a classic black sheath dress this would be a good purchase. For reference my measurements in these pictures are 47.5-38-44.5 and I am 5’7. Have any of you had success with ASOS fuller bust clothing? I’m so happy you find my reviews helpful. Thank you!